Looking for great resources to support your primary science curriculum (including the new 2014 National Curriculum requirements for science in England)? Make sure you check out the LearningGrids website for a host of brand new science resources to help support the teaching and learning in your classroom. Topics covered include plants, materials, forces, magnetism, circulation, states of matter… and many more! Activities range from simple matching to open-ended speaking tasks and demonstrating scientific knowledge. They include Clicker classics like sentence building, reading books and word banks. You’ll also find some great new activity ideas such as picture prompt discussion resources, sorting activities, charts and investigation writing frames, all designed to help get your pupils thinking and learning scientifically. 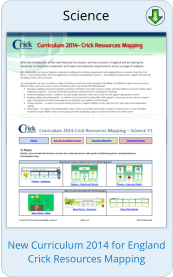 For a fantastic teacher planning resource, giving you a complete overview of the activities available on LearningGrids across science topics and year groups, make sure you visit the Curriculum 2014 page on the Crick Software website. Here, you will find useful information and a link to a PDF document that maps our existing Clicker resources to the statutory requirements. As usual, we’ll be working hard this autumn to continue bringing you more fantastic classroom resources, focusing on curriculum coverage as well as seasonal themes, across the age ranges, so keep checking the website regularly! As Content Editor at Crick Software, Jo is involved in creating and editing resources for new and on-going curriculum projects, including those on the Crick Software’s free LearningGrids website, as well as keeping up-to-date with the latest curriculum developments.